I’m here at the PRSA International conference in Washington D.C. and the conversations about social media are to be found everywhere. The halls, the exhibit floor, sessions and even at the fantastic dinner hosted by Shonali Burke last night. 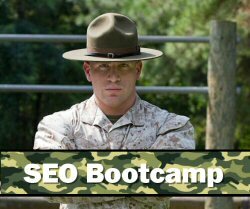 Yesterday I gave a 4 hour workshop or, “SEO Bootcamp for Communicators” as it was titled. I polled the attendees who came from a variety of companies and organizations ranging from a for profit private school to the Veteran’s Administration, on what their questions were about SEO. Most revolved around getting to understand how PR can get up to speed on the value of SEO and incorporate it into what they’re doing as Marketing has done. To that end, one of the things I touched on in the workshop and that I will also address in a solo presentation today on Social Media Optimization, is a model for incorporating Social Media & SEO into news promotion. Objectives: What are your goals? You can’t finish your mission without an end goal, so it’s important to identify some kind of general website traffic, citations, links, social engagement and organic referring traffic goals. Audience: Who are you trying to reach? This question can be answered at a broad level in relation to online PR and news content as well as at the individual content level. Keywords and promotion tactics can vary whether it’s direct to consumer, journalists, analysts or bloggers that you’re after. Social Conversations & SERPs: Listening to social conversations about the topics important to your company, brand and constituents is essential for knowing where to engage and promote. Think of it as reconnaissance. The SERPs, (Search Engine Results Pages) are your SEO battlefield and it’s important to understand what types of content is being displayed for your most important keyword phrases. While personalization is a factor that can make the SERP experience vary according to your location and web history, it still makes sense to identify what media types are included: web pages, images, video, blog posts, news, etc. Resources: Content, people, processes. What content and media do you have to promote? If you put out a press release, adding images and/or video can increase distribution quite a bit. Who do you have available to you to help? Copywriters, IT, marketing. Adding SEO and Social Media components to content authoring and publishing processes will ensure more of your content goes out in an optimized state. Tactics: What channels to optimize? This is where information captured in Listening and SERPs helps you decide what kind of content and which social channels to optimize for. If news, images and video are represented in the search results and there are relevant conversations happening around social media sites including some or all of those media, then your “marching orders” are to leverage those types of media in your news optimization. 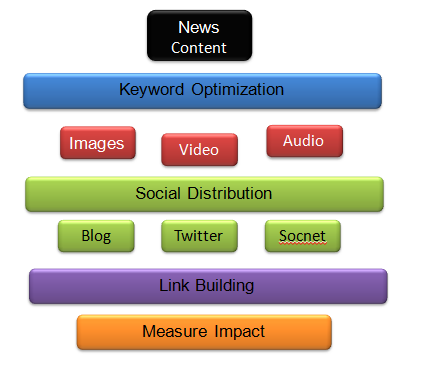 Measure: SEO, Social, PR. Knowing when you’re a success is important for productivity as well as reporting upstream in your organization. Setting goals, making benchmark measurements and then tracking progress as skills and effectiveness are refined will help you stay on track. When companies and individuals enter the Social Media and SEO waters, it’s often very tactical and tentative. Testing is fine of course, but making the effort to establish some kind of framework and process can reap big efficiency / effectiveness rewards. By adding a process, it adds accountability as well as the likelihood that a much greater quantity of content will be keyword optimized and promoted to extend the reach of news direct to end consumers as well as to journalists and reporters doing online research. I never knew the importance of link building for SEO ranking until a few months ago. Good article on the importance of this topic. Great article Lee. I’m a little bummed that I missed the workshop, but I appreciate you mapping out the process to publish content above. I’m gonna use that structure and enjoy the results. I really like this framework and I think it touches on a lot of what’s missing in many brand’s approach to SEO and PR. I think too many brands and agencies look for a quick fix with a third party solution and they miss a lot of the benefit of what SEO can do for them and how valuable of an asset a press release or other news can actually be. In my 10+ years working for large PR agencies, I never got more than blanks stares when I mentioned link building. Thanks for posting this framework. It really helps me visualize how SEO works hand in hand with social marketing. Listening to conversations that are happening on social media and monitoring SERPs is a great way to set benchmarks. Thanks for the post, the Objectives is very important. It’s all very well wanting to get to number 1 in Google but what are your Objectives when you get there. I like this approach. I have noticed that a few people forget about the SEO aspects when dealing with social media campaigns. we dont have to ignore Social media , it is one of our activities every day !!! Sometimes all this can be overwhelming for someone new to online marketing. I am relatively new but I am slowly learning how to link. I am also of the over 55 generation which makes it a little more difficult to understand social media. Your post helped me to see how to organize my time and focus for optimal results. Thanks. Are you using it? What do you think? Thanks for your reply, Lee. No, I haven’t used it yet but am shopping around for something that provides that functionality. I will check out the link you provided. Appreciate it! SEO and PR need to work together. After all, there is no point in doing a PR campaign to find that people are searching for you but you’re not ranking. Epic Fail. Getting PR pros up-to-speed on the value of SEO… now that’s a noble pursuit! I learned a lot during your one-hour presentation at BlogWorld last week – I can only imagine all the great info you can provide in a four-hour workshop. I would just like to point out that I still like to have different social networks for different purposes, and personally I don’t use Facebook for other than my personal friends and connections – where I can discuss more intimate stuff. I therefore do not usually link my FB to say LinkedIn or even my page. I know I am not the only one out there in folllowing that policy. Once more, congratulations on a great post. The online market for a new one can be overwhelming sometimes. How can I link to, but slowly I am learning, I’m new. I was a little difficult to understand that social media is also am on the 55 generation. How to focus my time and your post helped organize and the right results. Thank you.